Av Rhuddem Gwelin. Pocket. Del 1-2 i serien The Merlin Chronicles. Del 3, An Isle Full of Noises– the Merlin Chronicles, är planerad till 2018. 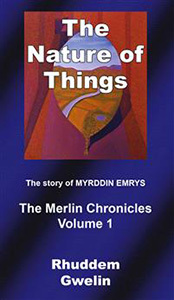 The Nature of Things: The legend begins in 6th century Britain. The Wrathful Traveller: Merlin lives again, 11th century Crusades.